Click here for an interactive map of meat processor locations statewide. Download the list of current meat processors. ADDITIONAL DEER PROCESSORS NEEDED NOW! Due to the increased numbers of deer donations statewide, HSH is looking for additional meat processors in all counties to assist with processing for the upcoming season. We need more than one processor per county due to demand. HSH registered deer processors are paid in full, at an agreed to rate at the end of the season. 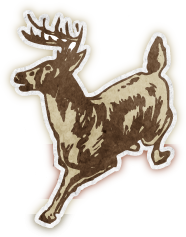 If you are interested please fill out the Meat Processor Application and mail back (Hunters Sharing the Harvest 6780, Hickory Lane, Harrisburg, PA 17112) or scan it to jwp@sharedeer.org. If questions please call 1-866-474-2141 or 717-545-1188. If you have been registered as a Hunters Sharing the Harvest (HSH) participating meat processor since 2016, and NONE OF THE INFORMATION ON YOUR AGREEMENT HAS CHANGED, including name, location, insurance and PDA inspection certificate, you only need to fill out the new HSH PROCESSOR RENEWAL CARD and mail it back (Hunters Sharing the Harvest 6780, Hickory Lane, Harrisburg, PA 17112) or scan it to jwp@sharedeer.org. We will verify and be in touch to finalize the agreement for the season. Please click the link below to fill out the forms and mail in ASAP in order to participate this season. If you have questions about the program, please call 1-866-474-2141 or 717-545-1188. Copyright © 2016-17 Share Deer. All Rights Reserved.